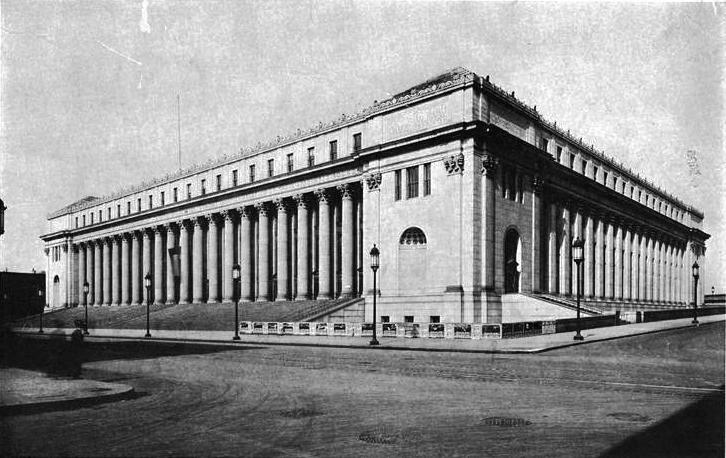 In 1910, the year that McKim, Mead and White’s colossal Pennsylvania Station was completed, ground was broken directly across 8th Avenue for their next major project, the United States General Post Office. 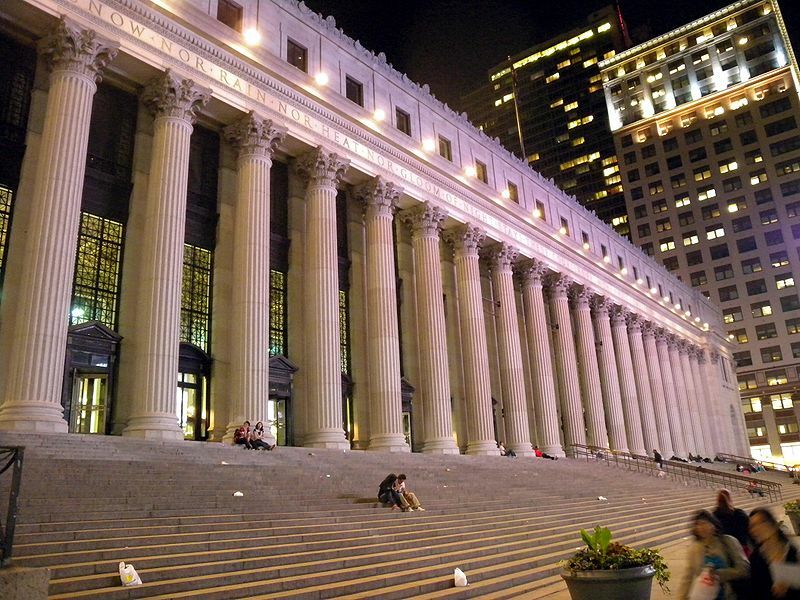 Pennsylvania Station was a gigantic Roman Classic-style edifice. The architectural firm promised The New York Times that the post office building “will harmonize with the architectural plan of the railroad terminal.” Indeed, it was intended to be a continuation of the monumental Roman station. “The entire group of buildings will be on a scale commensurate with the Forum of Rome, presenting colonnaded and pilastered facades complimentary to each other and lending themselves to a unity of scale and style of marked effect,” reported The Times. Mirroring the width of the train station, the great granite structure would span the entire two-block stretch of 8th Avenue from 31st Street to 33rd Street. The quotation was chosen by one of McKim, Mead and White’s architects, William Mitchell Kendall, who felt it not only nicely filled the cornice but provided a lofty description of the postal service. A century later the quotation has been permanently attached to the postal service by the American public; although it was never the official motto of the United States Postal Service. Each of the elevations was treated by the architects with nearly equal importance, as were the individual facades of the station across the avenue. When it opened in September 1914 there were 1,667 employees and space, according to Postmaster Morgan, for nearly double that amount. The new post office was that largest in the country and, according to The New York Times, “possibly in the world.” The main corridor, which ran the two-block length of the 8th Avenue façade, was clad in Botticcino marble and decorated with ornamental ironwork. 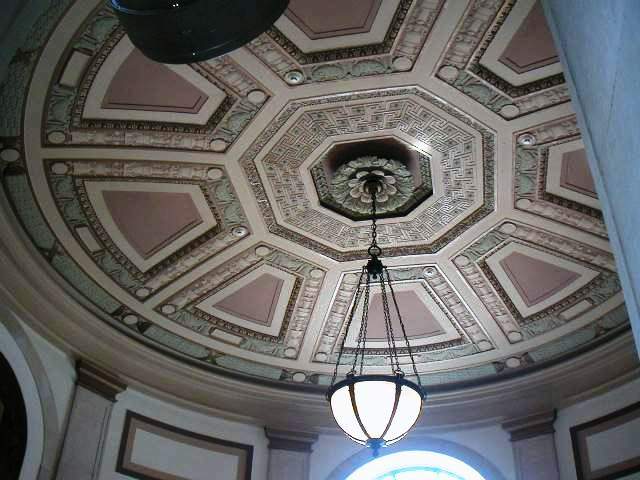 The deep coffered ceiling, gently arched to avoid the visual illusion of sagging, was two stories above the Knoxville marble floor. 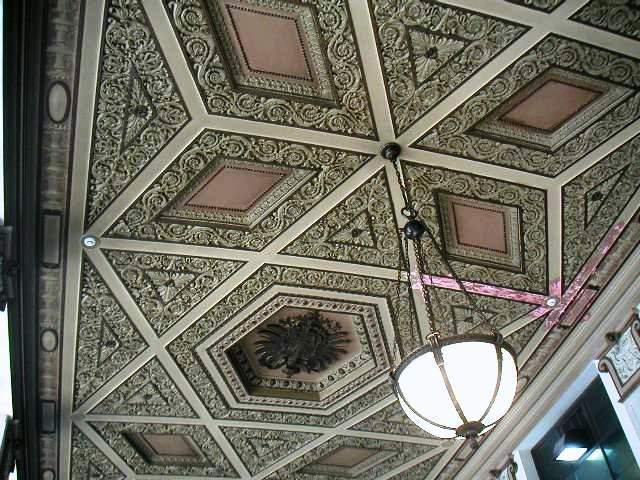 It was divided into 28-foot sections in which were embedded the seals of the ten countries of the postal union. The Seal of the United States was centered, flanked by Great Britain and Germany – a detail that caused considerable controversy a few years later when the United States entered World War I and factions clamored for the removal of the German seal. Above the corridor on the third floor were the mahogany paneled offices of the Postmaster and his staff. Included on this floor was a “committee room” – what would today be termed a conference room. It was the first of its kind in an American post office. Behind the delivery and receiving offices at the main corridor was the enormous mail handling room. Covering an acre of floor space and covered by a 206 feet long by 160 feet wide wired glass ceiling, there were no visible supporting columns. Forty feet above the floor, “perforations” were provided through which Postal Office Inspectors could keep watch on what was going on below. The station was built over the train tracks to Pennsylvania Station. In the basement was elaborate equipment for transferring huge quantities of mail to and from the trains. Most impressive, however, was the ingenious system of pneumatic tubing that whisked mail throughout the city. Costing $350,000, the system of 24-inch tubes shot 100-pound mail bags in both directions between Grand Central Station and the new post office at the rate of 30 to 90 miles per hour. Bags of mail were reached their destination in a minimum of two minutes. 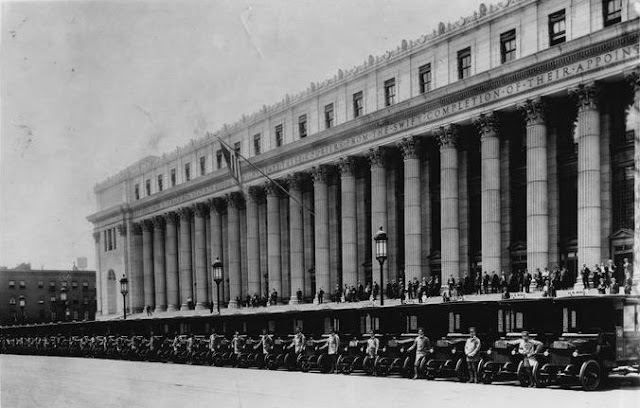 In 1934, in the midst of the Great Depression, the post office building was doubled in size under the leadership of Postmaster General James A. Farley. The McKim, Mead and White design was extended to 9th Avenue almost seamlessly. 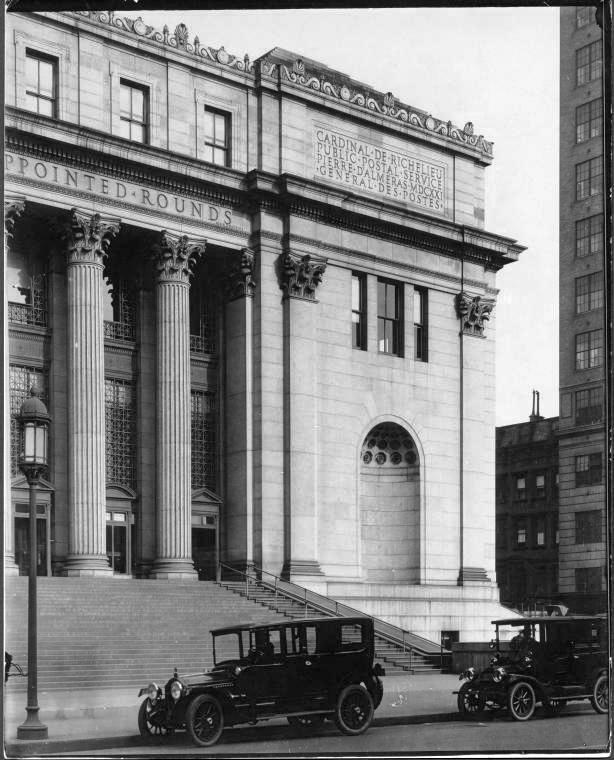 Subsequently the facility was renamed the James A. Farley Post Office. 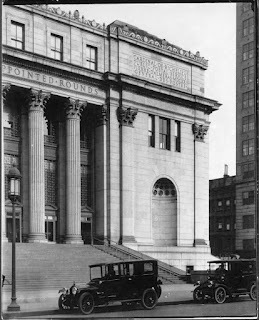 Throughout the 20th Century, until 1990 when reduced revenues forced belt-tightening, the Farley Post Office remained opened 356 days a year, 24 hours a day. Around the same time the cavernous space was no longer necessary. The late New York Senator Daniel Moynihan envisioned a recycling project that would renovate the old post office into a new train station, including a glass covered atrium and the largest media wall in the world. Designed by architect David Childs and named the Moynihan Station, preliminary construction began in 2010 after more than a decade of dealings among the State of New York, the US Postal Service, the Federal Government, Amtrak and the City of New York. Thankfully McKim, Mead and White’s masterful and monumental companion piece to the lost Pennsylvania Station has a secure future.